Valletta, Mdina, Gozo, Comino, Marsaxlokk, and more! 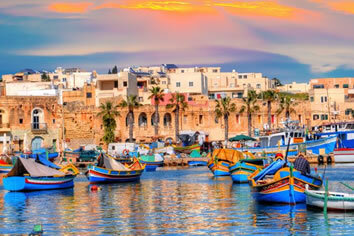 Malta is Europe’s number One ranked destination for gay travellers. 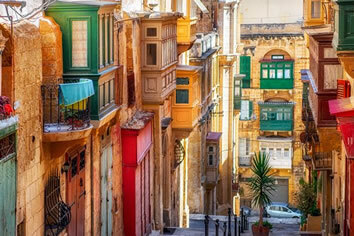 Malta packs glorious variety into its small archipelago. You'll find prehistoric temples, fossil-studded cliffs, hidden coves, thrilling scuba diving and a history of remarkable intensity. Malta's landscape contrasts rocky stretches of coast that end in dizzying limestone cliffs with sheltered bays that hide gin-clear water and red-gold beaches. Despite its size, Malta has an energetic and lively gay scene. The popular chain of gay clubs AXM has a franchise here in the vibrant resort area of Saint Julian’s. You will find most gay venues here. • Reach the famous fishing village of Marsaxlokk with its painted boats "Luzzus"
• After arrival, transfer to your hotel in St. Julian / Sliema area. • Free time and enjoy a walk in Sliema district and have a drink in one of Malta’s coolest bars, conveniently located right in St Julian’s. • Choose from themed bars, vintage bars, prohibition bars, cocktail bars, sports bars, karaoke bars and more. Nestled in the backstreets of the islands party capital there are many exciting venues to choose from where you can enjoy live music by some amazing DJs. With an exciting range of events on every day of the week, it’s sure to become one of your favourite haunts. • Free time for dinner and accommodation at your hotel in St Julian's. 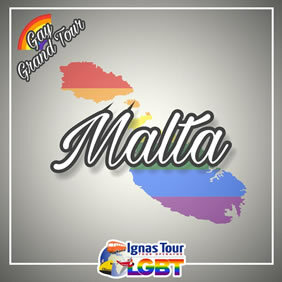 Rainbow Tips: Own the night in one of the many LGBT bars and pubs of Malta. Its thriving gay nightlife is located in Paceville, where you can find places like Michelangelo Club Lounge. 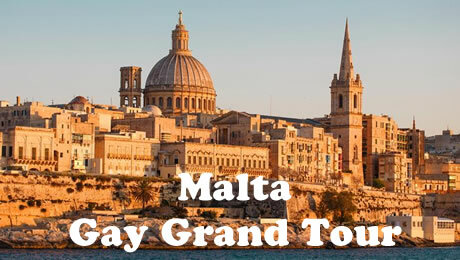 • Buffet breakfast and be ready to learn more from the Capital City of Malta: Valletta! 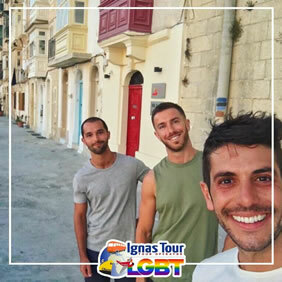 • Together with your LGBT Friendly Tour guide, explore Malta's Capital City which is a real World Heritage site. Reach by Public Bus the city center of Valletta, known as Il-Belt, which contains buildings from the 16th century onwards, built during the rule of the Order of St. John of Jerusalem, also known as Knights Hospitaller. • Enter the City Gate, a masterpiece by Renzo Piano, afterwards observe the Parliament House and Royal Opera House, then visit St. John's Co-Cathedral (entrance fee included) where you will see the painting 'The Beheading of Saint John the Baptist' by Caravaggio, considered one of Caravaggio's masterpieces and the only painting signed by the painter. • Continue then walking through the bustling streets, reaching National War Museum, passing by the Grand Master's Palace and finally arriving to Upper Barrakka Gardens for a breathtaking panorama of the Grand Harbour. • After lunch on your own, continue by Ferry from Valletta to the Three Cities, Cospicua, Vittoriosa and Senglea. 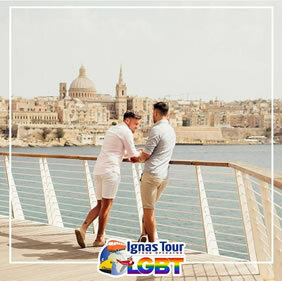 • Explore with your LGBT Friendly Tour Guide the city of Cospicua, a double fortified harbour city and the largest of the three. It was also given a title as Citta’ Cottonera, but erroneously the title is now used to define the whole region. • You will then arrive in Vittoriosa, which is ideally situated for safe anchorage and over time it has developed a very long history with maritime, mercantile and military activities. Prior to the establishment of Valletta as capital and main city of Malta, military powers that wanted to rule the Maltese islands would need to obtain control of Vittoriosa due to its significant position in the Grand Harbour. • The third city Senglea is also called Civitas Invicta because it managed to resist the Ottoman invasion at the Great Siege of 1565. The name Senglea was given by the grandmaster who built it, Claude De La Sengle. The island on which Senglea lies was joined by a land bridge to Cospicua during the time of the Knights of St. John and as a result, it became peninsular in shape. • Afterwards back to Valletta by bus or ferry. • Dinner on your own and accommodation at your hotel in St Julian's. • Buffet breakfast and departure to the famous Dingli Cliffs, the highest in Malta, plunging a sheer 250m into the sea. On their rocky top is found one of Malta's more unusual sights. Known as Clapham Junction, this is the largest collection of Malta's mysterious cart ruts that crisscross the surface of the rock. They are mysterious because nobody quite knows how or when they were made and experts can't agree on whether they were deliberately cut or simply eroded by vehicles. • Afterwards continue to Rabat where a visit to the Catacombs of St. Paul and St. Agatha is worthwhile and a sure adventure. • Then proceed to Mdina, built on a plateau in the centre of the island, the city's old Baroque buildings, cathedral and magnificent bastion walls dominate the rural skyline. Mdina, once the capital of Malta until the modern city of Valletta was built in 1565, has had many names including Melita (Roman occupation), Medina (Arabic occupation), Citta' Nobile (Knights of St. John) and Citta' Vecchia (after Valletta was built). Today is also referred as the Silent City since it inspires tranquility at any time of the day or night. The only way to really experience and enjoy this city is on foot, explore the quaint alleys, narrow streets, ancient buildings and magnificent far-reaching views from the high bastion walls. • Your next visit will be Mosta where you will see the church in the centre of the city, built in the 18th century. It became known throughout the country in 1942 when during World War II, a dropped bomb failed to explode, thus sparing the lives of some 300 people. • Continue to the town of Ta'Qali, located nearby was once a British WWII outpost, but has been converted to a village for local handicrafts. You will be able to watch local artisans at work blowing elaborate glass art pieces, intricately assembling original silver filigree jewelry, carving the local limestone and many more. This is the perfect place to pick up treasures that will remind you of your Malta visit. • Back to Sliema/St. Julian's area. Dinner on your own and accommodation at your hotel in St Julian's. • Buffet breakfast and departure from Sliema ferries. • Board on your vessel, cruising towards the island of Comino, passing Comino through the north Comino channel towards the Island of Gozo, which is also known as the island of Calypso. • On arrival at the Mgarr Harbour you will be welcomed by our representative who will drive you around this beautiful island. You will first drive through the village of Xewkija where you drive past the largest church in Gozo which also boasts being the third largest unsupported dome in the world, then you will have the pleasure to taste Gozitan products and have a look around an Artisan Centre, followed by the village of Gharb, where you will see the famous Ta’ Pinu Church. • You will then proceed to the Capital City, Citadel. • After visiting this mythical island, you will proceed to Mgarr Harbour for your transfer to the Blue Lagoon. You will be informed which Captain Morgan vessel to board following a one hour stop for swimming and / or sightseeing at the famous Blue Lagoon on Comino Island. The Blue lagoon is famous for its turquoise, bluish-green crystal clear waters... truly, Malta’s paradise! We leave Comino and head towards Sliema once again via the north-east coast of Malta. • On our way back, we cruise past Mellieha Bay, St. Paul’s Islands, Bahar ic-Caghaq, St. Andrews, St. Julians, the Sliema Promenade and finally around Tigné Point to Sliema Creek. • Dinner on your own and overnight in St. Julian's. • Buffet breakfast and departure to Hagar Qim & Mnajdra Temples. • The megalithic complex of Hagar Qim is located atop a hill on the southern edge of the Island. All exposed rock on the island was deposited during the Oligocene and Miocene periods of geological time. • 500 metres from Hagar Qim stands the Mnajdra megalithic temple. The surrounding area is typical of Mediterranean garrigue in its starkness and isolation; it is designated as a Heritage park. A few hundred metres from the temple is one of the thirteen watchtowers built by Grand Master Martin de Redin, called Hamrija Tower. • Afterwards continue to the Blue Grotto caves, which are one of the natural wonders which you should not miss whilst in Malta. • Lunch on your own and then drive to Ghar Dalam, a prehistoric site which was discovered in the latter half of the 19th Century with a series of excavations unearthing animal bones as well as human remains and artifacts. The Cave is a highly important site for its Palaeontology, archaeology and ecology. The history of the cave and that of the Islands can be decoded from Ghar Dalam’s stratigraphy. The site consists of a cave, a Victorian style exhibition and a didactic display as well as a garden planted with indigenous plants and trees. • Afterwards reach the special town of Marsaxlokk, a famous village known for its big Sunday fish market and its many decorative “eyed” painted boats called Luzzus. The village has around 3200 inhabitants and in the past, most of the inhabitants worked as fishermen. The name Marsaxlokk comes from the word “marsa” which means port and the word “xlokk” which means south in Maltese. Marsaxlokk is the most important fishing village of Malta, with a large number of families very much involved with fishing. • Experience the unique busy atmosphere of the largest fish market on the island, with many Maltese travelling from as far as the north of the island to purchase the latest catch. The market itself offers a delightful variety of traditional Maltese things, from handicrafts to home-made delicacies, as well as other less traditional items such as clothing and houseware. A smaller version of the market is also held daily. • After the visit and having a drink, back to Sliema/St. Julian's area. • Buffet breakfast and departure to the Northern Part of the island. • Reach the Popeye Village which has grown from its days as the Film Set of the 1980 Musical Production ‘Popeye’ into one of major tourist attractions in Malta filled with a number of colorful fun activities for all young at heart. 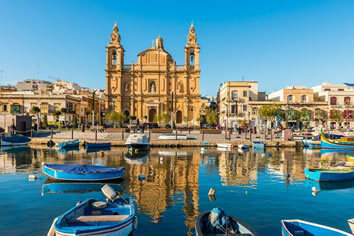 • After the visit continue to Mellieha and observe its imposing church. In the Xemxija area, you can take a walk along the old Roman Road, and you are sure to stumble across the remains of the Roman aviaries, located near a carob tree which is thought to be about 1,000 years old. • Further akin you can enter the Mizip forest for a lovely walk, and head around the hill towards the quaint Mistra Bay, stopping at the Roman Baths for a rest while taking in a breath-taking view. • After lunch on your own stop and relax in one of the most popular beaches on the Maltese Islands, the Golden Bay and the Ghajn Tuffieha Bay. • Afterwards continue to Bugibba, Qawra and St. Paul's Bay where you will have free time to take a walk. • Back to Sliema/St. Julian's area. • Dinner on your own and overnight at your hotel in St. Julian's. • Breakfast in the hotel and transfer to the Luqa Malta airport. Set in the lively district of Paceville in central St. Julian’s, the stylish design Hotel Valentina offers a seasonal outdoor swimming pool, free WiFi throughout, and air-conditioned rooms with ultra-modern furnishings. Free private parking, a seasonal bar and lift are available on site. Rooms at the Hotel Valentina come with an iPod docking station, satellite LCD TV as well as a minibar and tea and coffee making facilities. The private bathroom includes a hairdryer and shower. Some rooms boast a furnished balcony. Guests can enjoy a drink in the lounge bar open daily and serves a range of cocktails and wines. Breakfast is a varied buffet and is served in the bright breakfast hall. A few steps away, a restaurant under the same ownership, serves Mediterranean dishes. The property is located a 5-minute walk from both Portomaso Marina and Spinola Bay. It is a 10-minute walk to the mall, Dragonara Casino and an easy stroll to the nearest rocky and sandy beaches.